Best Walk Behind String Trimmer – Top Selections For 2019! 5 Best Case Trimmer for Reloading – In-depth Guide & Reviews For 2019! If you’re reading this article, chances are that you’re searching for the best 4 cycle string trimmer. But what does it mean to be a great 4-cycle trimmer? Well, in our opinion, no gadget qualifies to be called the best if it’s not good enough for you. For that reason, here are our thoughts on some alternatives available at your disposal. Whichever trimmer you settle for, the most important thing is that you get good value for money. Here’s a detailed review of 9 top-rated 4-cycle string trimmers in 2018 and 2019. The TB575 from Troy-Bilt is one of the few gasoline-powered trimmers that combine power with precision. In fact, this is one of the easiest-to-use machines that we’ve come across so far. For instance, it comes with a Click N Trim bump head. This flexible head is ideal for making cuts and trims in all directions. What’s more? This trimmer is designed in such a way that it easily accepts optional trimmer attachments. So, we would confidently rank this machine as a highly versatile one. This is all thanks to its multi-position handle. The handle is easy-to-adjust and, therefore, ideal either for left or right-hand use. The Troy-Bilt TB575 comes with a powerful 29cc engine. This 4-cycle engine is not only clean but also quiet. We’d attribute this to the fact that this machine is well-sealed and uses high-quality features. An engine capable of delivering constant power. Strong and straight shaft for extended reach. Designed with jump-start abilities for easy starting. Dual line bump head for easy loading of string. A little harder to start than other models from Troy-Bilt. Husqvarna cycle trimmer is a grass trimmer with a four-stroke engine, which includes: bevel gear, loop handle, and flexible drive shaft. The engine of the trimmer has been designed in a way that the trimmer can start quickly with minimum effort. This yard trimmer is a classic machine that doesn't require fuel mixing nor gas mixed with fuel. You only need gasoline for the trimmer to run effortlessly. The cycle trimmer is a certified refurbished machine which has been tested and designed to look like new. The process of refurbishing that makes the machine new includes: inspection, repackaging, and basic cleaning. The Husqvarna cycle trimmer comes with a minimum of 90 days warranty. When ordered, the machine comes with all its accessories; it arrives in a generic box. Its best features are that of an air purge, meaning that air is being removed from the carburetor during fueling, making it easy to start the machine. You can easily start the machine as you only need to tap and go the heavy duty twin line cutting system. Ryobi 4 cycle trimmer is a grass trimmer which is one of the lightest four cycle machines in the market. The Ryobi trimmer is comfortable and convenient as there is no need for oil and gas mixing. The huge advantage with Ryobi 4-Cycle Curved Shaft Gas Trimmer has over the others is that it's lightweight. It is easy to maintain, big on power and has no noise while trimming. The grass trimmer expands its attachments with other attachments to save on money, time and space; this indeed makes it convenient for handling it. The trimmer cutting width increases its power up to 10.7lb. More so, the Ryobi 4 cycle has a straight extendable shaft that can curve making it easy in maneuvering. It also has a bump feed string that is reel easy with a dual of 0.095 in line for easier and fast reloading. Besides, the four-cycle trimmer has a four-stroke 30cc engine with a powerful but low emission engine. Poulan Pro 4 cycle trimmer is a grass trimmer that has a shaft gas making the trimming machine easy to use. The trimmer has a four-cycle engine trimmer that needs no mixing of oil and fuel. The Poulan pro four cycle trimmer is known for its cost-effectiveness, efficiency and the fact that it is easy to use. The trimmer has one of the best features which includes the fact that the machine has a 28cc four-cycle engine with a cutting width of 17 inches. In addition to this, the trimmer is has a tap and go dual exit head with a straight shaft. This incredible trimmer is made in China and has a pro link attachment system with a split boom shaft that is transformed into a multi-functional garden machine. The trimmer also has extra attachments like pole pruner, a blower, brush cutter and an edger that can be bought separately. Poulan 4-Cycle trimmer has a spring assist recoil that gives a loop handle with a thin grip handle that enables easier clear cutting of weeds and stubborn grass. More so, 4-Cycle straight Shaft Trimmer extendable shaft making it easy in maneuvering. It also has a bump feed string that is reel easy with a dual of 0.095 in line for easier and fast reloading. Besides, the four-cycle trimmer has a four-stroke 30cc engine with a powerful but low emission engine. Cutting width of 17 inch. Poulan 4 cycle gas trimmer is a grass trimmer that has a curved shaft that makes the starting of the trimming machine easier. No more mixing of fuel and oil as the trimmer uses gal to function. The trimmer has a 17 maximum cutting width with a spring assisted start system. The Poulan gas curve shaft trimmer is efficient, cost-effective and very convenient. The trimmer is a pro link attachment system that has a split boom shaft that the trimmer changes into a multi-functional yard machine. The trimmer has additional accessories that include a brush cutter, a blower, pole pruner and a cultivator. An edger can be bought separately in case you are interested. To top it all up, the trimmer has a 28cc four-cycle engine with a powerful but low emission engine. It has a Tap-N-Go dual exit head that with a curved shaft. Moreover, curve Shaft Trimmer extendable shaft making it easy to maneuver. It also has a bump feed string that is reel easy with a dual of 0.095 in line for easier and fast reloading. The BCF31 is a grass trimmer with a powered engine of 31CC 4 stroke. The machine is known to have a design that reduces emissions and provides long life. The four-stroke engine is modeled to eliminate the mixture of oil and gas. The trimmer's starter is designed to start quickly and easily. That's not all; vibrations are reduced by the fact that the transmission has been supported by aluminum casing, while the shaft has been built with a durable and lightweight aluminum tube. The straight shaft design is comfortable and easy to use. The straight shaft trimmers head allows for a quick line feed for the cutting twin line system. The machine has extra accessories that include harness and brush cutter blade. 4-Cycle straight Shaft Trimmer extendable shaft making it easy in maneuvering. It also has a bump feed string that is reel easy with a dual of 0.095 in line for easier and fast reloading. Also, having a four-stroke engine, the four-cycle trimmer has a powerful but low emission engine. The engine of 31CC 4 stroke. Aluminum casing has supported the transmission. Craftsman straight string trimmer is a grass trimmer that enables you to say goodbye to brushes that consume your time while trimming. The string trimmer has a full crank engine of 26.5 ccs with a powerful but low emission engine. The trimmer is a four-cycle engine that is gas powered which doesn't really depend on gas or oil mixing technique. More so, 4-Cycle straight Shaft Trimmer has extendable shaft making it easy to use. It also has a bump feed string that is reel easy with a dual of 0.095 in line for easier and fast reloading. The straight shaft trimmer is a featherweight, as it has used 57 straight shaft that is comparable to most two cycles machines in the market. The machine also has two separate cutting heads making it easier to operate. Another useful feature about this machine is that it has a toolless D-handle making maneuvering while trimming easier. An engine of 26.5 cc. The troy four cycle is a grass string trimmer with a string which makes it easy to start the machine and use it. The Troy 4 cycle grass and weed trimmer has a straight shaft with a molded grip of multi-position handle. The trimmer is designed to accept other optional trimmer attachments, with an option to jumpstart the electric start adapter. The attractive features of this excellent machine are that it has the 18 cutting width that enables you to get a clean and neatly cut grass in short time. Besides that, the trimmer has a four-cycle engine which runs efficiently and produces less noise. The machine has a 3-year warranty that makes the machine trusted. The four-cycle straight gas trimmer comes with a lot of power, high performance with less hassle to your machine. The four cycle with low emission engine reel easy bump making the trimming process an easy and fun one. The extended shaft makes it easy to reach hedges that may be under the deck, around the obstacles and even the hidden places. With the four-cycle gas trimmer, you do not have to worry about mixing fuel and oil as the trimmer uses gas. The trimmer is able to be attached, accepting the nine expand the universal door attachments. Besides, the trimmer has a 3-year warranty while offering less hassle and power. Avoid mixing gas and oil. Its fuel tank is too tiny. 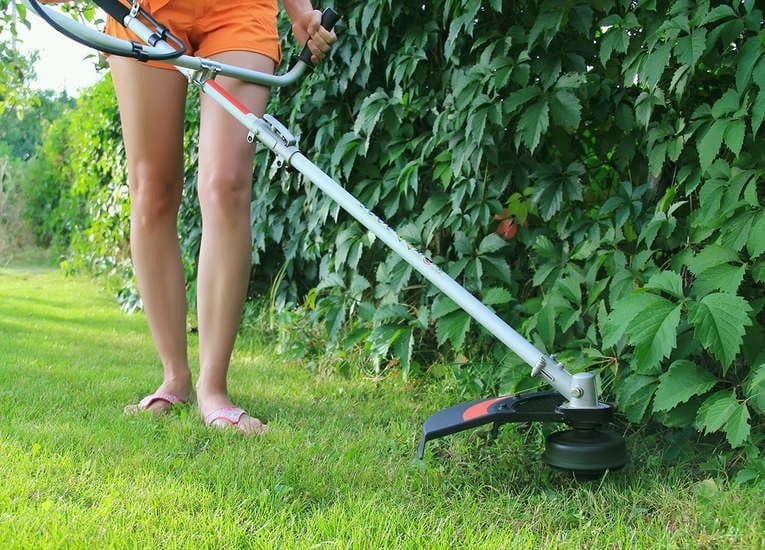 There are several factors to always keep in mind when shopping for a cycle string trimmer. Once you have these figured out, it will be super-easy to make an informed decision. Big engines tend to have more cutting power. But how big is big? Well, any engine that ranks above 25cc should be big enough to handle most projects. Anything below that might be too tiny for commercial work and would, therefore, be best used for tiny, domestic tasks. Some old model 4-cycle trimmers required one to mix oil and gas when refueling. That, unfortunately, made them so difficult to manage. Fortunately, you can always tap into a machine that doesn’t involve this. Another common challenge with 4-cycle is that some require a few attempts to jumpstart. For that reason, it’s advisable to only go for a machine with minimal starter cord-resistance. Most importantly, you should only go for a machine that’s optimized to start easily. The type of shaft you go for matters a lot as it influences how you handle the trimmer. A curved or bent shaft wouldn’t, therefore, be the best pick. It would be a good idea instead to go for a straight shaft. Typically, straight shafts are easier to maneuver. There’s nothing as rewarding as trimming the hedge in a noise-free and environment-friendly way. But is it really possible to find a gas trimmer with such benefits? Well, it may not really be possible but we recommend going for one that’s minimalistic in both ways. It’s a good idea to go for a trimmer that operates relatively quietly. Most importantly, go for one that doesn’t emit too much carbon. Not only would such a machine be safe for the environment but also good for your health. Much as you’d like to go for a huge engine, it’s worth remembering that it may consume more fuel. Pundits recommend checking how efficient an engine is by listening in to different 4 cycle string trimmer reviews. By doing that, you can judge whether a trimmer provides you with an efficient run-time or not. Given all those factors, which 4 cycle string trimmer is the best? You might be wondering. Our best pick is none other than the Troy-Bilt TB575 Straight Shaft Trimmer which comes fully-loaded with a 29CC engine. We love it because it comes with a powerful engine which is also highly fuel-efficient. In addition, it boasts a straight shaft which is well-designed to provide a great reach under bushes and shrubs. Last but not least, the Troy-Bilt TB575 has a built-in JumpStart technology which makes it super-easy to operate. Your 4 cycle gas trimmer with attachments is a full-package that can make your life extremely easy. However, it’s important to familiarize with different trimmer parts names. This would make it easier for you to order from your supplier in case a part requires to be replaced. Some common parts and accessories include the spool, knobs, fuel gas lines, head covers, carburetor, and replacement heads. Fortunately, for common brands, these parts are readily available even in local stores. It’s also worth noting that different 4 cycle gas trimmer warranty packages exist. Long warranty periods are generally preferred. Only manufacturers who strongly believe in the quality of their products would extend such covers. So, watch out for cheap string trimmer manufacturers who are always looking to defraud you. Also, a good warranty is one that covers all possible manufacturing flaws. So, before you rush to replace an accessory, be sure to double-check the conditions for your warranty. Some replacements may cause your warranty contract to be null and void. 4 cycle string trimmers are designed to take the hassle off all hedge trimming roles. The good thing with using these trimmers is that they’re pretty powerful and, therefore, ideal for hedging huge swathes of land. Usually, you may not need to worry about the weight of the trimmer overwhelming you since you can always get the job done fast. TrimmerAdviser.com is a review-based blog that participates in the Amazon Services LLC Associates Program. We do often get a small commission for the products we feature in our articles. In addition to Amazon, we also link to other affiliate marketing sites that we deem trustworthy and of immense value to our readers.